As promised, I'm back with more details on the cards I created for the Summer Mini Hop. Please contact me if you have questions I don't answer!! Remember too that you can click each project to enlarge it and see the details better. The card base here is Soft Suede. 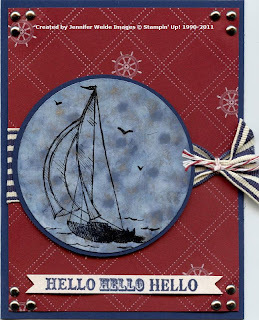 The background is Baja Breeze that I texutred in the Big Shot with the "diamond" Texturz plate. I still seemed a little plain, so I spritzed it with Log Cabin Smooch Spritz. Love the effect of this and the color coordinated perfectly with Soft Suede. BUT-remember to do it in a confined area. A box or something works great. You can never guarantee where the spray is going to go!! The focal image was watercolored on Watercolor Paper with Watercolor Wonder Crayons. I started by stamping the boat with Black Stazon. Then I added color. Watercolor paper is great for blending and moving color around until you get your desired look. With the crayons, you can either put some color directly down on the paper, or pick it up on your blender pen. Blender pen is my choice for coloring, Fresh ones. If they are dry or too frayed they aren't going to do what you want. OK, back to the colors! The sky was lightly done with Baja Breeze. This I did by lightly applying Baja around the boat and then blending. The boat and flag at the top were done with Cherry Cobbler. The Cherry I picked up with the blender and blended til I liked it. The water is Not Quite Navy. I made sure to accent the wave marks directly with the crayon and blended it out. I then added other color by picking up from the crayon with the blender pen. The sails are Soft Suede. The accent strip across the front is Soft Suede. I stamped the saying from Pretty Postage in Cherry Cobbler on Cherry Cobbler and cut down to a size to layer onto the Postage Punch. I used the Postage Punch and punched a Not Quite Navy. That element is layered onto the center of the strip. On each side I wrapped around some Cherry Cobbler Baker's Twine and knotted it. Then I grabbed some Build-A-Brads. 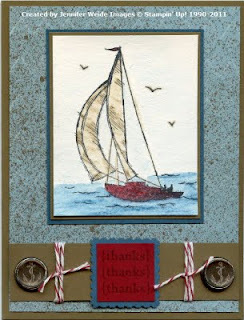 To those I added an "anchor" punched from the Nautical Expedition DSP. 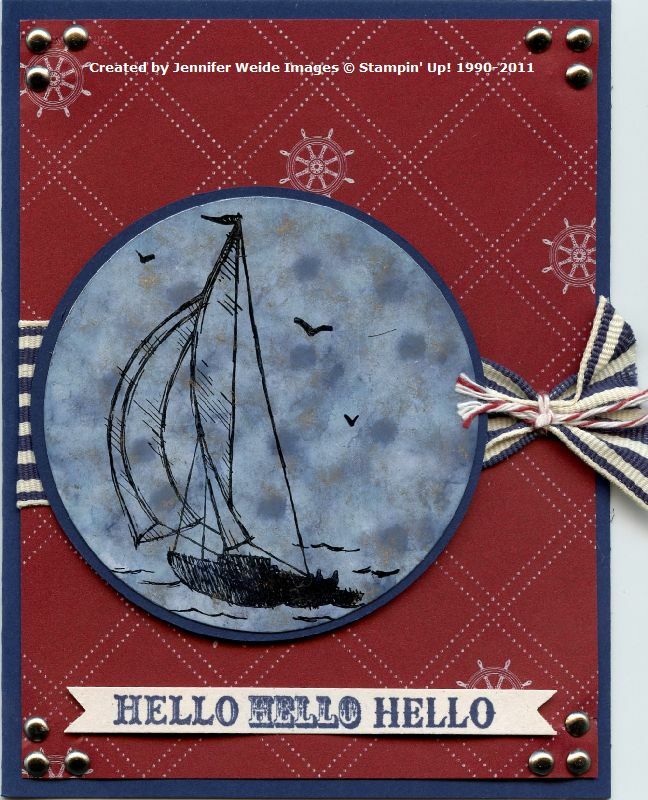 Card base here is Night of Navy. 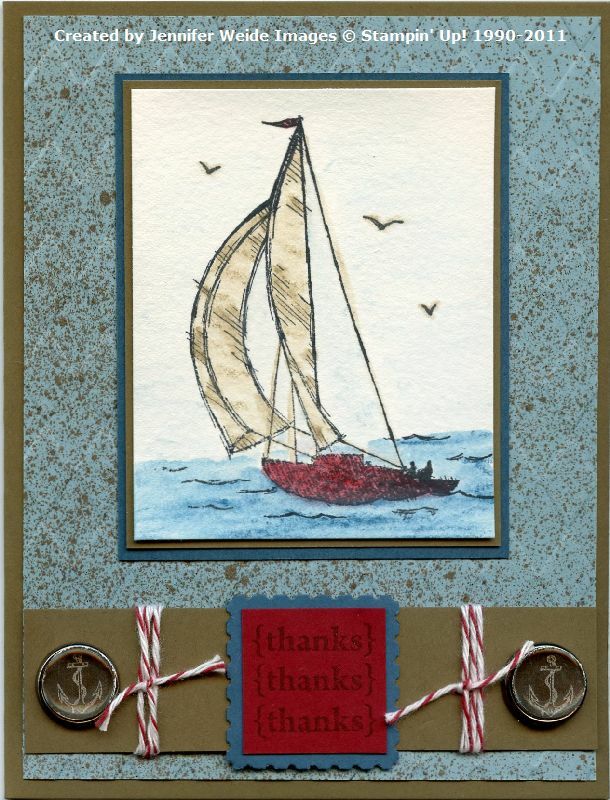 Background is a Cherry Cobbler print from the Nautical Expedition DSP. Great colors together!! The main image is done with the Polished Stone technique. You start with Glossy Card Stock. That I cut with the 3" Die in the Big Shot. Next, grab your rubbing alcohol (I prefer the 91% for faster drying), cotton balls and reinkers. True Polished Stone has always involved metallic inks. I never liked the Encore inks because they didn't dry. You had to spray it with an acrylic sealer to get it set. We no longer have those so I decided to try the Shimmer Paints. I first did my colors on the Glossy. Wet your cotton ball with alcohol-you want it wet but not dripping wet. I used 4 drops on color: 2 of Bashful Blue, 1 of Marina Mist and 1 of Night of Navy. Dab that around on your Glossy until you get the blended look you want. The more you dab, the more it will blend. At first you will have dots of color, but they blend together. Then grab a new cotton ball, wet again with alcohol and add Platinum Shimmer Paint. I used my stylus to add the shimmer paint because I wanted the "drop" look to it too. After that dries, stamp the boat with Black Stazon. The accent circle of Night of Navy was cut with the Circle Scissor. I don't use it often, but if you want a circle of a certain size it's the perfect tool! I initially thought to layer the two circle dies, but it was too much difference in size. Behind the circle is a Wide Night of Navy Striped Grosgrain Ribbon. I attached it between the layers on one side, then knotted the other side with Cherry Cobbler Baker's Twine. I angle cut the end of the ribbon and attached it down with mini glue dots. Next I added the saying to look like a banner across the bottom. I stamped it in Night of Navy on a strip of Naturals White Card Stock. You could use scissors to cut the ends, I used a square punch. One worked perfectly, the other not so much :) I waved it a little when attaching. The two outer "hello"'s have dimensionals under them, the center is attached direct. Doubt that you can see that in the picture. It still needed something at this point so I grabbed the Silver brads, Mat Pack and Paper-Piercing Tool. 3 brads one each corner and it's good to go!! Whew-that's probably way more than you wanted to know!! Thanks for coming back today!! Tomorrow the last card and the favor box.